Dungeons & Dragons: "Perception Check"
Last night was the first night of our 4th edition campaign. We only made it through a single encounter, but it went over relatively well all things considered. 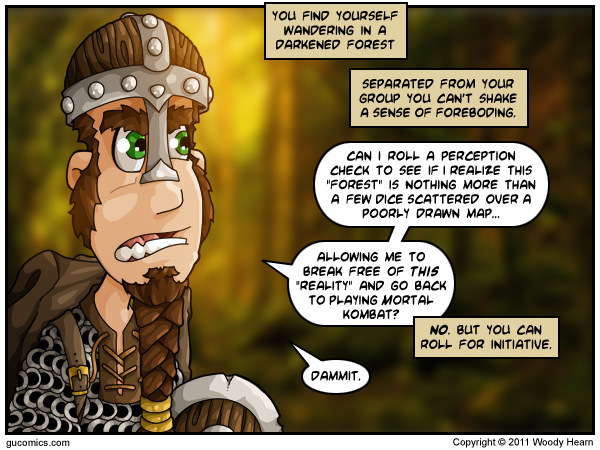 Now obviously Tedothalik never swung his sword, but this comic is inspired by a true story. We roll the clock back some 20 odd years to find a handful of friends and myself sitting around a table, heavy with Dragonlance 2e sourcebooks and a module I can't remember the name of. One of the participants was sprawled on the couch behind us having quickly tossed together his character: a dwarf fighter. He informed us to wake him "when it was time to kill something". I didn't bother to ask what he rolled. I didn't care. I told him he was successful, told him to go back to sleep, and removed his character from the campaign.